Newton's Nook Designs: Shop 'til you Drop Card and Black Friday SALE!! If you're planning on being a Black Friday Shopper or not, here's a card to make you smile today! 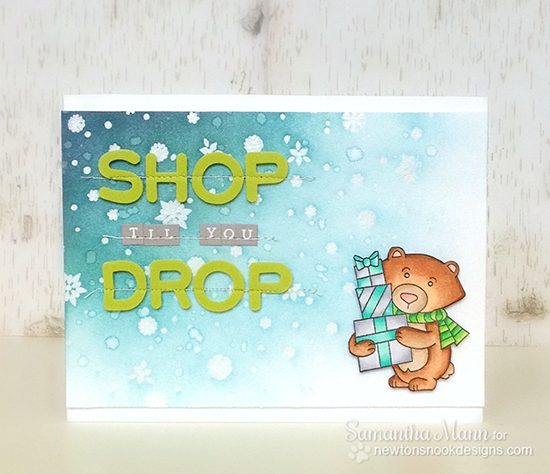 Samantha Mann created this adorable bear card to celebrate our weekend sales! It features our bear, Winston, from the Winston's Home for Christmas stamp set - he's got his shopping done and his gifts all wrapped! I wish I was as prepared for the holidays as he is! Are you heading out to the stores today to shop? Or do you prefer to stay home in your PJ's and shop online? If you're doing any online shopping today, We've got a BIG SALE today in our shop! PLUS - we've added a bunch of sets at discounted prices to our SALE category - and you can use the coupons in addition to the sale prices - so make sure to check those out for even bigger discounts! Great sale and such a cute card! Love it! This card is too cute and perfect for Black Friday! And that's an awesome sale! I just placed my order, woohoo =D! Awesome sale and lovely card by Samantha! Thank you.